This is a great gift for anyone who wears a badge to work. Why not show off your badge in style. 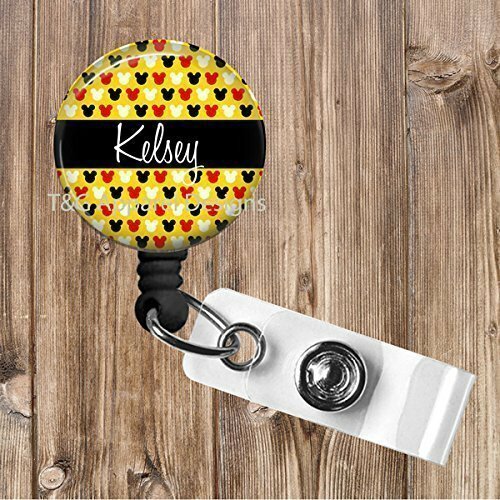 This new style of no twist badge reel means that your ID/Badge will always be facing forward at all times. The design is on a 1 1/2 inch button that has mylar on the top so that it can be wiped clean. All badge reel will be BLACK. Your item will come in an organza bag ready for gift giving. Badge Reels "No Twist" feature which keeps your ID facing forward at all times Cord length of 34" Rating for 100,000 smooth pulls This badge reel provides for effortless swiping or scanning. NO RETURNS ON CUSTOM MADE ITEMS. Please note: Colors shown may vary in shading from the actual product received. If you have questions please send me a message. TEXT WILL BE WRITTEN EXACTLY AS GIVEN FROM BUYER. IF TEXT IS WRITTEN IN UPPERCASE LETTERS IT WILL BE IMPRINTED THAT WAY. If you have any questions about this product by T&G Apparel Designs, contact us by completing and submitting the form below. If you are looking for a specif part number, please include it with your message.